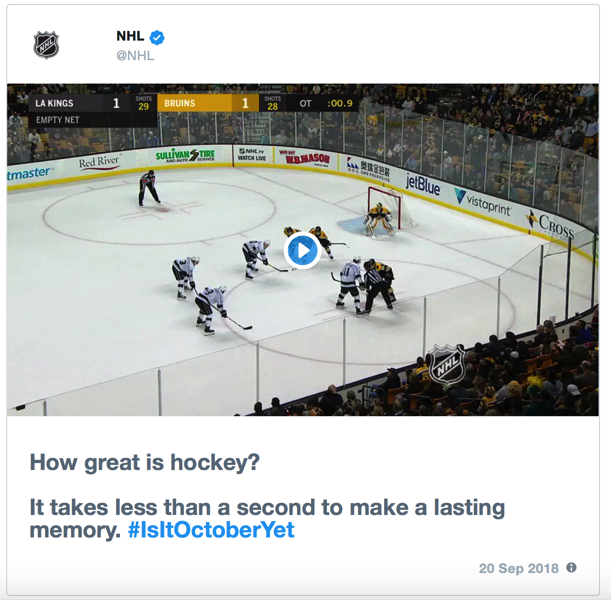 As the @NHL conversation heats up on Twitter across the U.S. and Canada ahead of the 2018/2019 season, Twitter Canada has shared the top trends, emerging superstars, and some familiar faces in new places that are defining how and when users talk about the league on the social network. Starting with the teams, Twitter has ranked the top 10 NHL team accounts that earned the most regular season mentions on Twitter during the 2017/2018 regular season, including Canada’s own Toronto Maple Leafs (@MapleLeafs) and Montreal Canadiens (@CanadiensMTL). Another list ranks the top 5 moments that drove the most Twitter conversation amongst fans of Canada’s @NHL teams over the past 12 months. And finally a list of the 10 most mentioned NHL players on Twitter over the past 12 months. For more game highlights, player content and fan reactions, keep following @TwitterSportsCA? ?, @TwitterSports? ?, and @TwitterCanada?.